I would say that my career path started before graduation. My course required me to complete a year in industry in my third year. 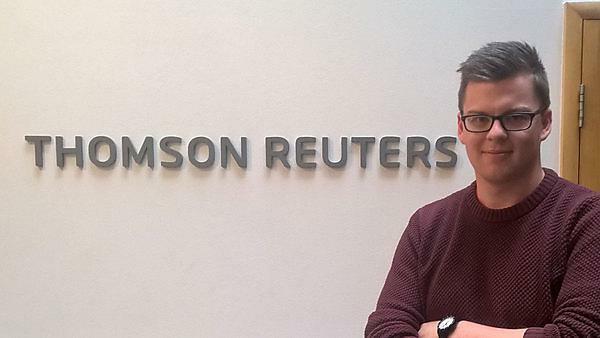 I undertook this placement at Thomson Reuters as a Network Engineer intern. When I graduated, I was lucky enough to get a position as a systems/network engineer in a parallel team to the one that I worked in as an intern. After about eight months I moved into a small and highly motivated team looking after Thomson Reuters internal cloud platform. I’m involved with a charity called CoderDojo, which provide free coding classes to kids aged 7-17. Back in June, I helped organise a girls only CoderDojo at Thomson Reuters UK head office in Canary Wharf for over 100 girls. It was a fantastic day. The internal exposure I got to some of the senior leaders in Thomson Reuters I hope will really help my career. I’m now helping the company roll out the programme to some of our other locations like Zurich, New York, and Bangalore. Just play; play around with open source software on some virtual machines on your laptop. Learn some Linux commands and scripting commands. Maybe teach yourself python and bash. There is tons of open source software out there that large enterprises do use. Some to look at could be Openstack, Docker, and Mesos. The course specialised in what I wanted to do, but it also gave you an appreciation of the wider IT industry which is something I believe has been invaluable in my career. Plymouth really is such a great city in which to be a student, with the beautiful views to clear your mind or the bars on North Hill – which frequently did the same job. I would definitely recommend undertaking a course at Plymouth University. I would do it again if I could. The wealth of knowledge is there to be tapped, and many of the lecturers are leaders in their field. The social opportunities and the study/life balance I think was spot on. Go and do a year in industry, even if your course doesn’t require it. I gained so much from the 14 months I spent as an intern that definitely helped me to succeed in my third year; not just technical skills, but organisational, communication, and project management skills.